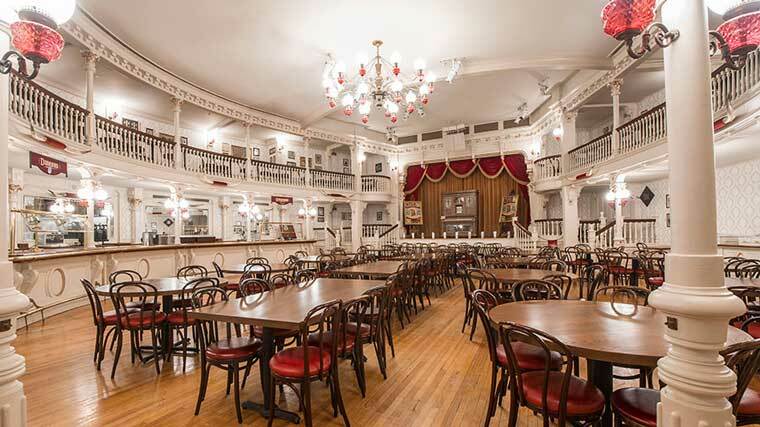 When crowds get big at the Magic Kingdom, the park opens an additional sit-down dining location in Frontierland’s The Diamond Horseshoe saloon. Originally a counter service location, the restaurant has been modified to support an all-you-care-to-eat family-style service. When this concept started, the menu was essentially a duplicate of the neighboring Liberty Tree Tavern. Last year they upgraded the menu introducing a new ‘one entree many sides’ menu. Now they’re trying something new by adding an a la carte menu to the all-you-care-to-devour option. Starting with the new A la Carte menu, you’ll love the wide selection of sandwiches, salads, platters and sides. The Carved Beef Brisket Sandwich with creamy coleslaw served on a brioche bun sounds delicious. 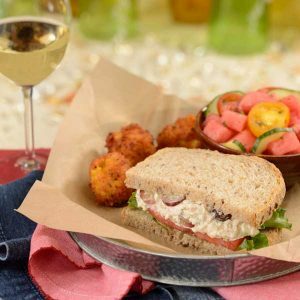 Other sandwiches include Creamy Turkey Salad Sandwich that’s served on multigrain bread with lettuce and tomato, or you can try the Grilled Chicken Thigh Sandwich with BBQ mayo, lettuce, tomato and onion served on a Kaiser roll. 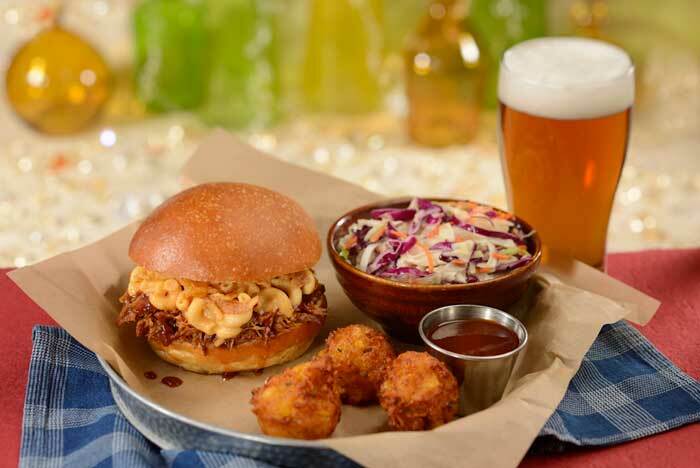 The BBQ Pulled Pork Sandwich with mac and cheese and crispy onions served on a brioche bun is destined to be a favorite. Or you can just get the Mac and Cheese with bbq pulled pork, crispy onions, and green onions! 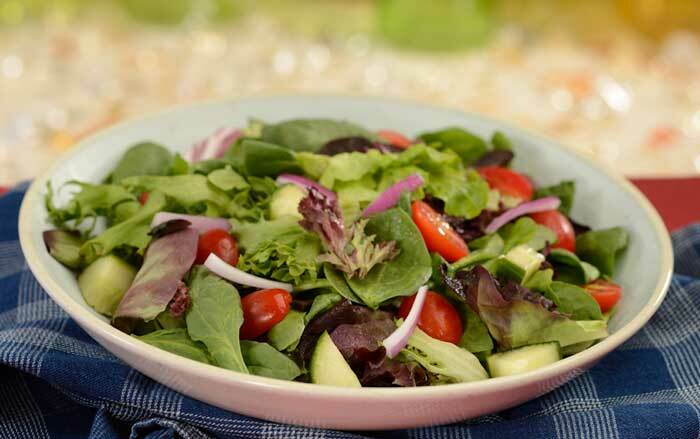 For those looking for a lighter option, there’s the Mixed Green Salad with cucumber, tomato, onion, and honey shallot vinaigrette. You can add your choice of any meat to top it off if that suits your style. Let’s not over look the platters! 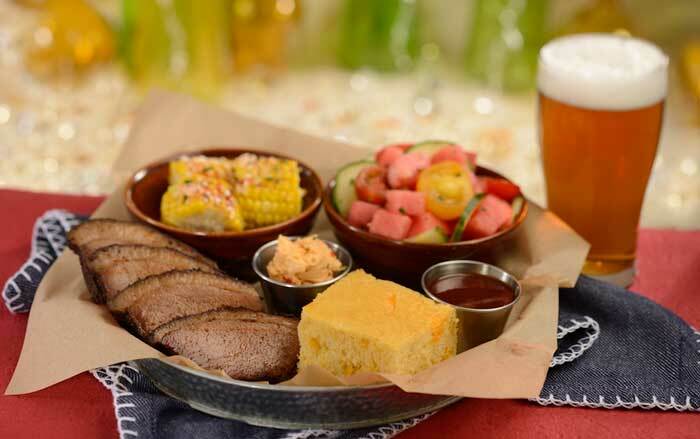 Served with your choice of two sides and cornbread, we’re ready to enjoy the Carved Beef Brisket Platter, the Smoked BBQ Pulled Pork Platter, the Grilled Chicken Thighs Platter, or even the Vegetable Platter with a choice of four sides! 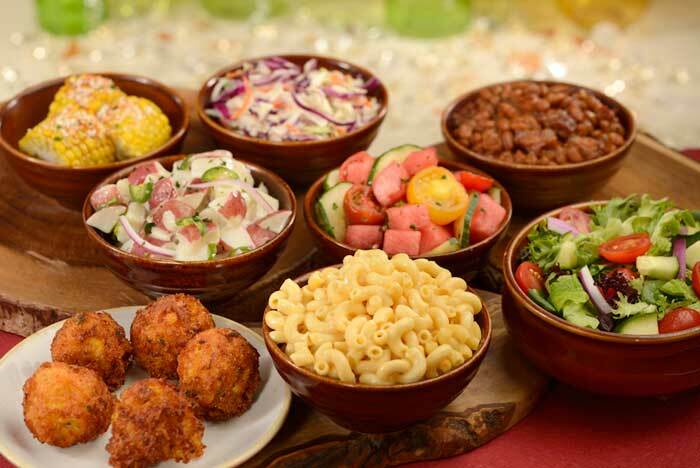 And there area plenty of sides to choose from, like the Potato Salad with grilled onions and a serrano dressing or Creamy Coleslaw with red and green cabbage. There’s also Jalapeno Cheddar Corn Bread with honey chipotle butter, Mac and Cheese, Corn on the Cobb with cheese, Corn Fritters, paprika, lime, and cilantro, and BBQ Baked Beans. Or chow down on a fresh House Salad or Watermelon Salad. 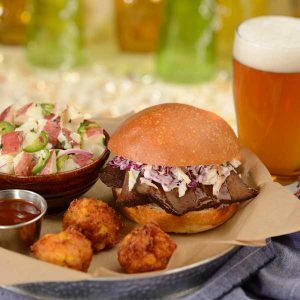 Speaking of sides, there are plenty to choose from, like the Potato Salad with grilled onions and a serrano dressing or Creamy Coleslaw with red and green cabbage. 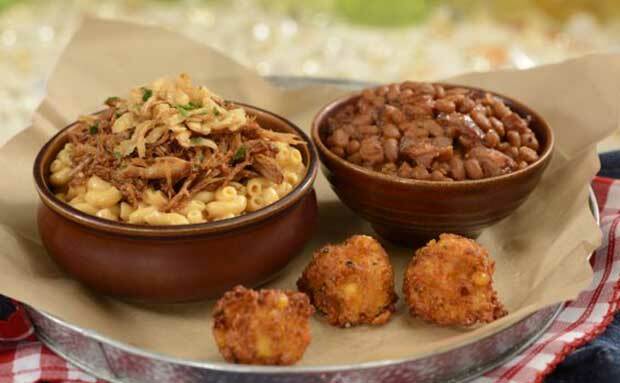 There’s also Jalapeno Cheddar Corn Bread with honey chipotle butter, Mac and Cheese, Corn on the Cobb with cheese, Corn Fritters, paprika, lime, and cilantro, and BBQ Baked Beans. Or chow down on a fresh House Salad or Watermelon Salad. Of course, you’re on vacation, so don’t skip the sweet stuff. 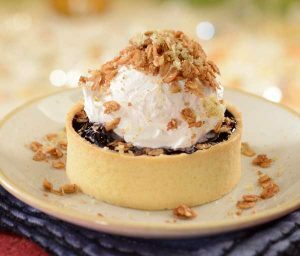 On the dessert menu are some tasty dishes – Buttermilk Chocolate Cake with bourbon glaze, Peaches and Cream Cheesecake with streusel topping, and a classic Blueberry Cobbler with lemon and mint cream and oat topping. 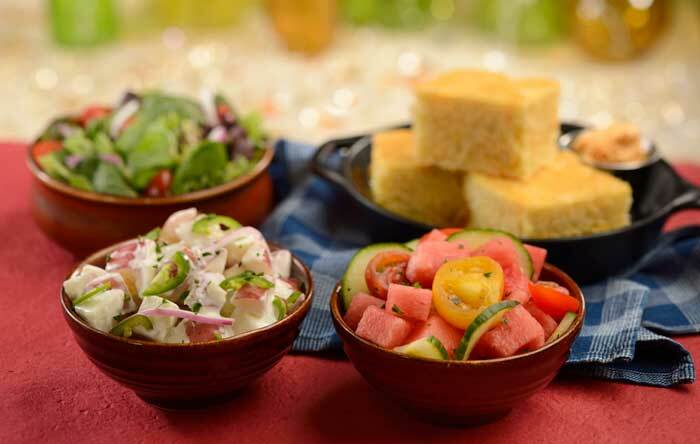 Your meal begins with the Appetizer Platter with Mixed Green Salad, Watermelon, Cucumber, and Tomato Salad, Potato Salad, and Jalapeno Cornbread. 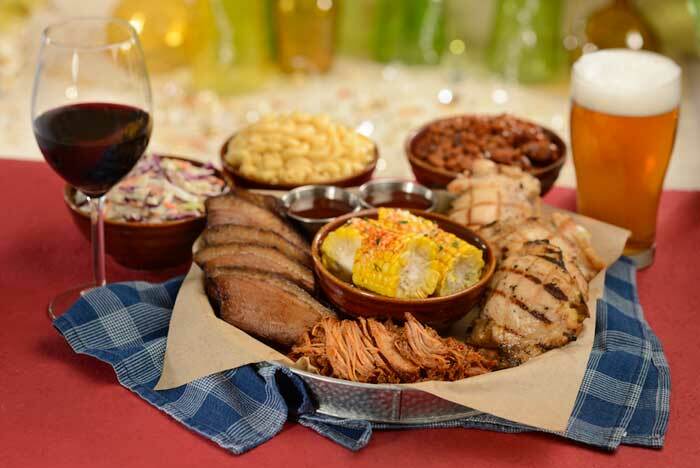 Moving to the entrée Platter enjoy hearty helpings of Carved Beef Brisket, Smoked BBQ Pork, and Grilled Chicken Thighs accompanied with Mac and Cheese, Corn on the Cobb, Creamy Coleslaw, and BBQ Baked Beans. 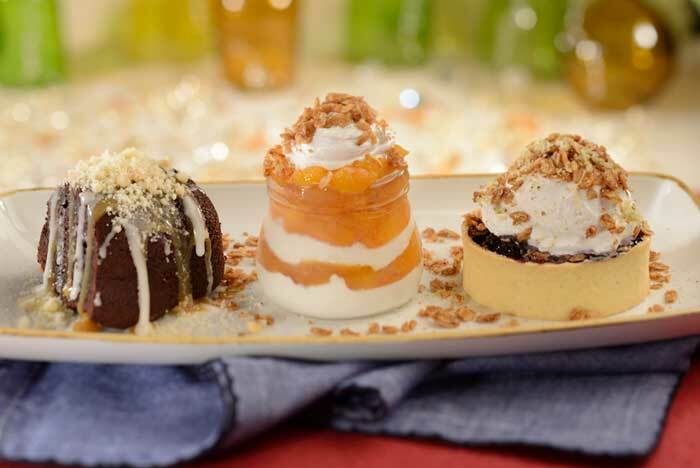 On the Dessert Platter you can try any of the tasty desserts including Buttermilk Chocolate Cake, Peaches and Cream Cheesecake, and Blueberry Cobbler. 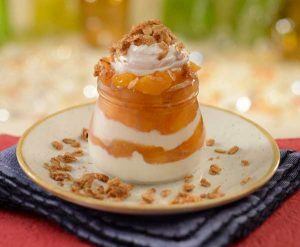 It’s nice to see Disney’s culinary experts expanding the options at The Diamond Horseshoe. 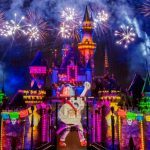 A recent kitchen upgrade for Liberty Tree Tavern and The Diamond Horseshoe make this all possible. The new menu starts on May 23. 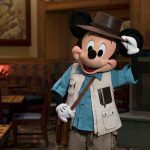 Now the only remaining question is when will they turn The Diamond Horseshoe into a dinner show. Slue Foot Sue is just a hoot and a holler away. 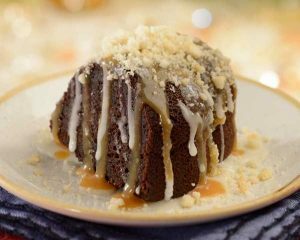 The Diamond Horseshoe is open daily for lunch and dinner from 1 p.m. to 7 p.m. Be sure to make your reservations today online or by calling (407) WDW-DINE or (407) 939-3463.